An anti-Israel student event was planned, and then canceled Monday, at New York University (NYU). The student, who has asked to hold an event unrelated to Israel, was actually planning an event to explore Israeli "brutality" against the Palestinians. 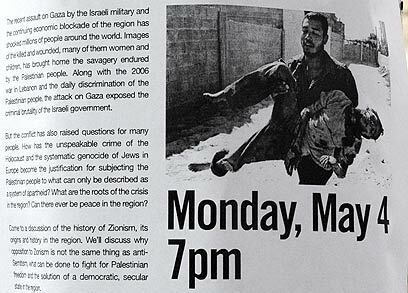 After receiving permission to host an event at NYU on May 4, based on a proposal for a forum on climate change, the student responsible then hung flyers for a conference on "The Hidden History of Zionism: The Road to Gaza's Killing Fields," to be hosted by the International Socialist Organization, an anti-war Marxist group. "The recent assault on Gaza by the Israeli military and the continuing economic blockade of the region has shocked millions of people around the world," read the flyer, which featured a picture of a bloody Gazan child from Israel's Operation Cast Lead against Hamas. The flyer queried how "the unspeakable crime of the Holocaust and the systematic genocide of Jews in Europe (could) become the justification for subjecting the Palestinian people to what can only be described as a system of apartheid" and called for people to learn "what can be done to fight for Palestinian freedom and the solution of a democratic, secular state in the region." "If this is not anti-Semitism, what is?" an Israeli residing near the university asked Ynet. "They're distributing these flyers all around the university and there are similar posters inside and off campus. It's strange to me that the university is giving them a stage. The contents of the posters are quite controversial." "I'm surprised by this… given the number of Israeli professors at the university," he added. In response, the university confirmed that the event had been canceled but emphasized that this was because of the fraudulent manner in which it was undertaken. They added that they had originally thought the flyer was not real because "there is no official, recognized group at NYU called the International Socialist Organization, and because the space was not reserved for the event listed on the flyer (but rather) for a forum on climate change… being conducted in conjunction with an academic department. Upon being contacted about the event, the university they "called in the student who reserved the space (who) acknowledged that the forum was not going to be about climate change but, instead, about the topic on the flyer, and that the academic department listed on the reservation had nothing to do with the event. "We informed the student that because the rules were not properly followed - she was telling the University one story, but posting a different story on streetlights - at this point the event cannot go forward. While the university emphasized its "long academic ties with Israel," it did not commit to eschewing such events in the future. "NYU has strong supporters of Israeli policies among its students and faculty; we also have strong opponents of Israeli policies here, too. This is what makes universities so strong: that they can be homes for scholars and learners with diametrically opposed views, and they provide a forum for a free exchange of strongly held views," the university's statement said. See all talkbacks "Anti-Israel event fraudulently planned, then canceled, at NYU"